Bonnie in Ok had the most liked content! Yes actually have an unopened package. Well I feel more confident about just letting it go. Thanks ! Well I am just questioning my price on this but it was agreed and paid for since then. Second guessing my worth and skill. However the customer has not returned and seems to be unhappy about something. It wouldn’t be so bad but I see her twice a month in a group setting. She always is cordial but not caring to talk. She found a different quilter for her projects and makes sure everyone knows who quilted them. I really don’t care if she is a returning customer but don’t want to have a bad report about my service. Should I let it go or press the subject with her? Looking for opnions on pricing the quilting the quilt was 76 3/4 x 88 3/4 . All marked and done by hand with machine. I was thinking about .05cents per sq inch. What is others opinions. I am wanting to sell my Bernina Limited Edition 830 because I am not using it much. It is in great condition and has all accessories to machine. It has always been serviced by Bernina and was recently serviced, so is in perfect working order. Can show proof of service work. I have original shipping boxes if necessary to ship. I am asking $3000.00 for all of it plus shipping. I am located in Pass Christian, MS. I have not experienced this problem. Thanks for all the info I did purchase a new Bernina 790 and really enjoying it. There is a local service for the machine so all is left is to sew. I had an 830 but didn't like it as much as the 790. I am looking at a Bernina 790 plus machine and wanting to know if anyone owns one and if there seems to be any issues with them? Thanks everyone I appreciate the encouragement. Thanks Linda for your information. Unfortunately I did not have the control and was told it was a gift. Nor did I know she was entering it. The batting was Hobbs 80/20 so there would have been a little shrinkage on that. Guess I will ask more of those questions if a quilt is brought to me. I have a question for those that might know. 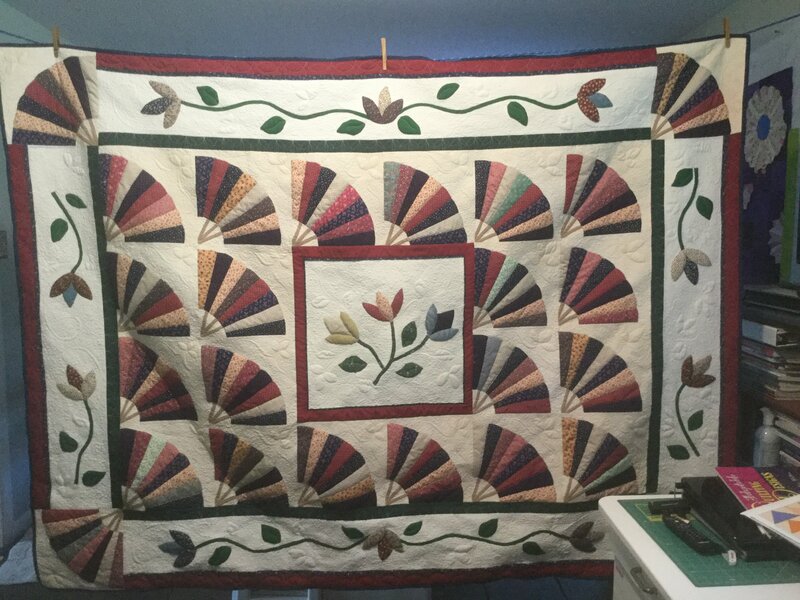 I recently saw a quilt I quilted hanging in a quilt show. I was disappointed to see how the quilting seem to have disappeared after the owner had washed it. The after pic did not turn out very well but my question. Is there something I could do differently to make for a better quilting look? I used white glide thread and my stitch length was 11. I don’t know but do most of the quilts in a show get washed. Just looking at them their quilting seems to show so well. I hope someone can share what I need to know to get a better result. Just wanted to tell all I got great service from APQS factory on my Millie. Thanks for all you do for your customers.